*Audited in accordance with AS9100D Requirements for Certification/Registration of AQMS. 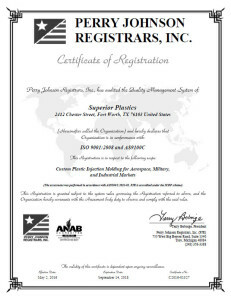 Perry Johnson Registrars is accredited under the Americas aerospace RMC. Standard AS9100 includes AS9100D quality system requirements and specifies additional requirements for the quality system of the aerospace industry. It is emphasized that the quality system requirements specified in AS9100D are complementary (not alternative) to the contractual and applicable law and regulatory requirements.